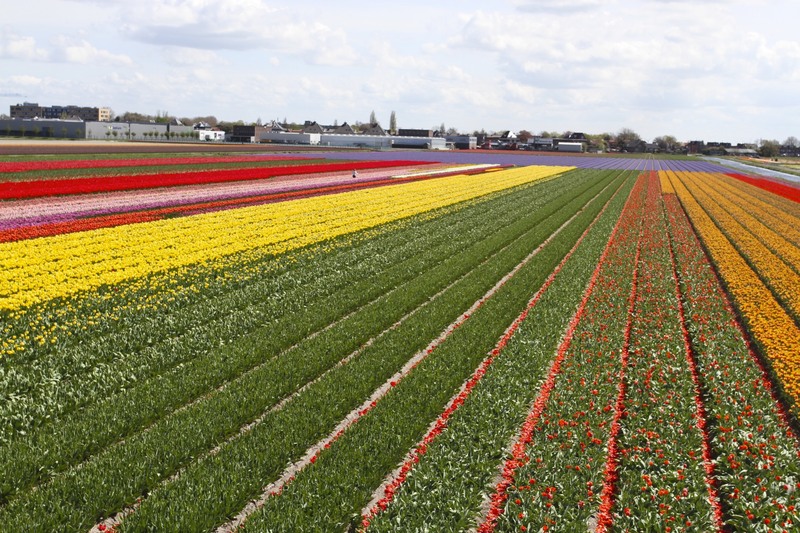 Just south of Leiden lies one of the prime flower and bulb growing regions in the Netherlands. 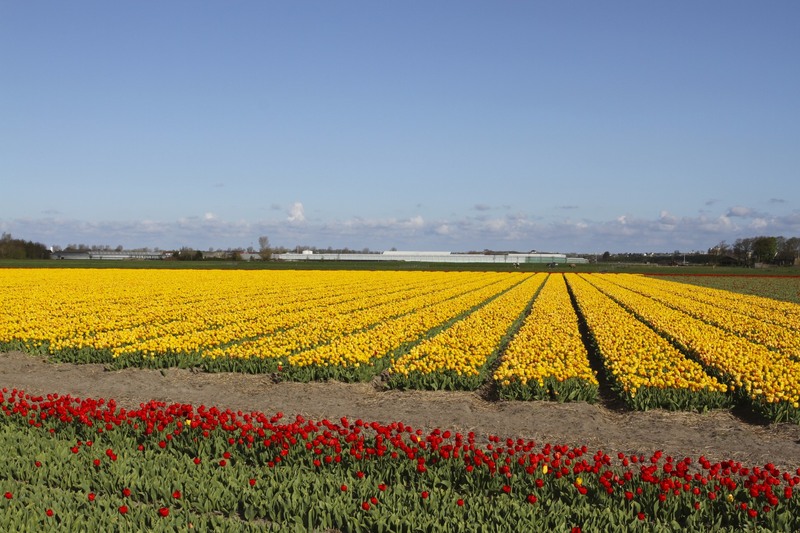 It’s an area filled with daffodils, hyacinths, irises and the most famous of all, tulips. 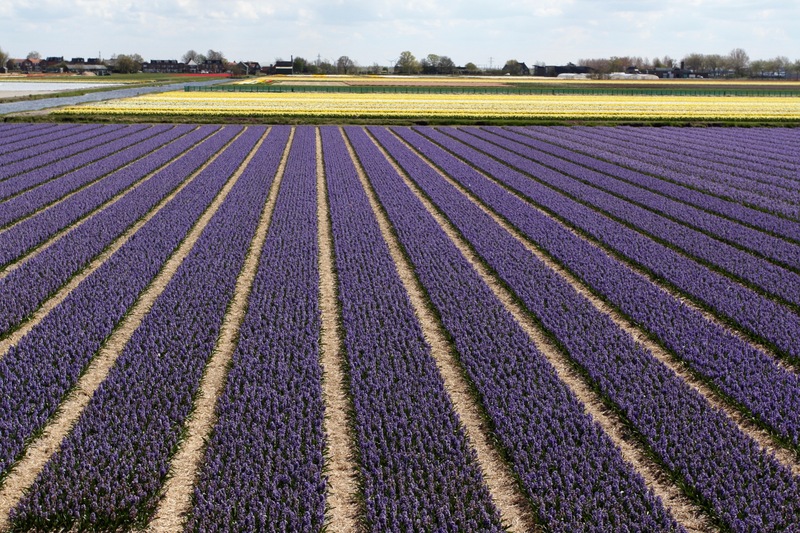 If you’re lucky enough to fly over this region when your plane comes in to land at Schiphol Airport, it looks like a giant patchwork quilt of brilliant reds, purples, pinks, yellows, oranges and whites. It’s a magnificent sight, and one so famous that it draws people from around the world to see it. 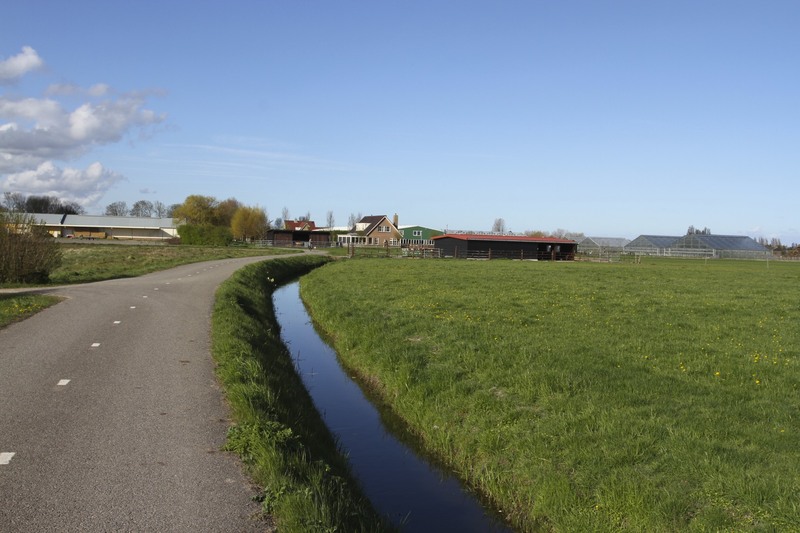 It’s equally impressive seen from the seat of a bicycle as you travel from village to village through the region. 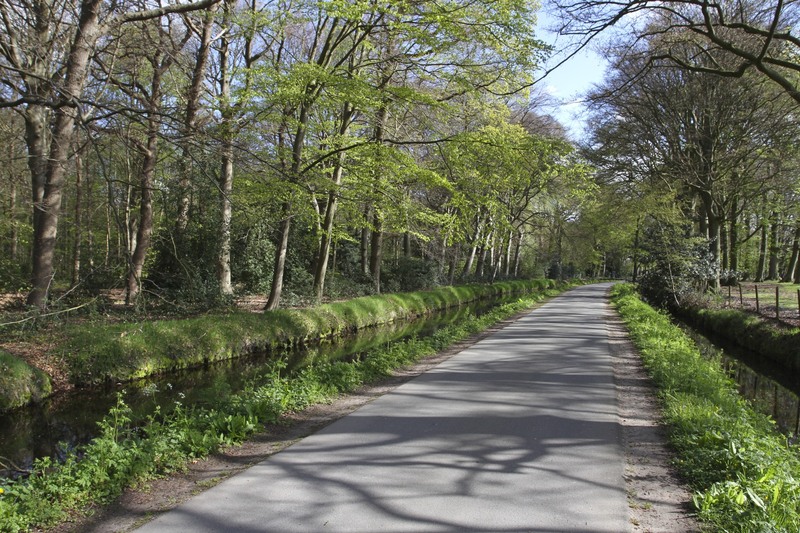 Over the last few weeks I’ve been regularly cycling through this area as part of my training for a cycling sportive. It’s been lovely to cycle through the flower fields, passing vibrant blocks of colour as different types of flowers arrive and then disappear only to be replaced by another variety. 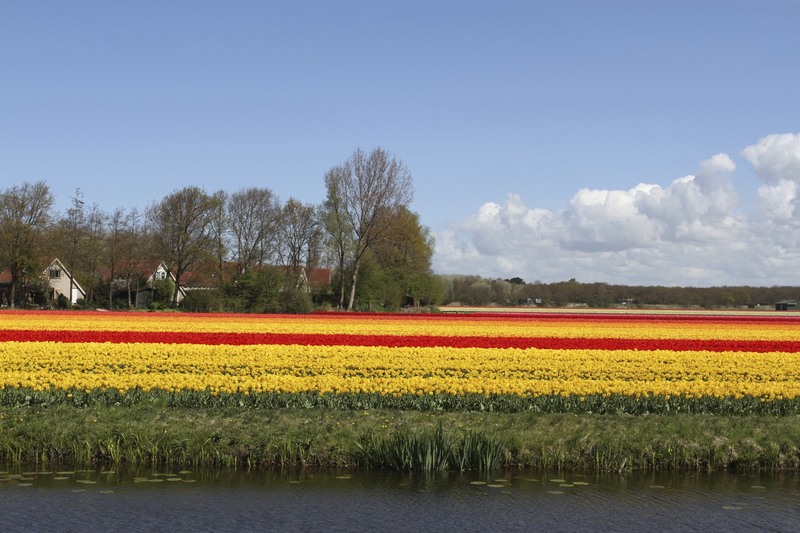 There’s something appropriate about the arrival of the flowers, a multicoloured marker of the end of winter and the onset of summer – a welcome explosion of vibrant colour after a long winter of grey skies and brown fields. 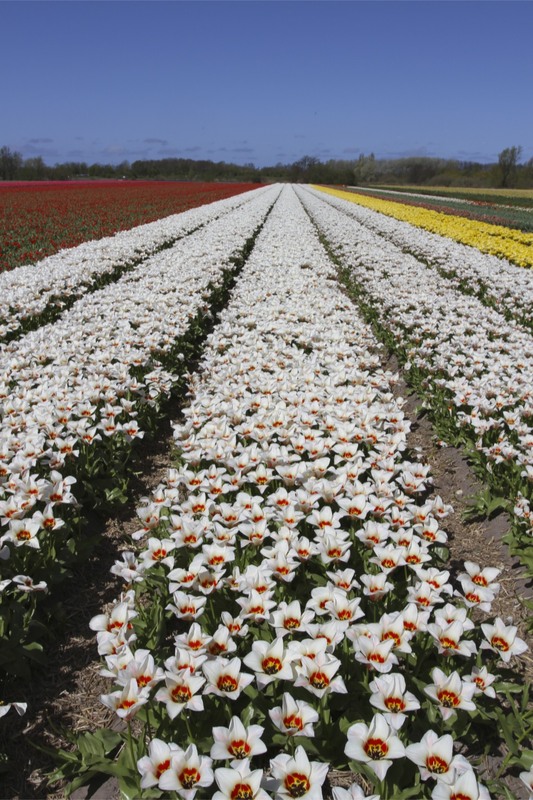 The splash of colour lasts only a few weeks, during which millions of flowers are cut and exported around the world. 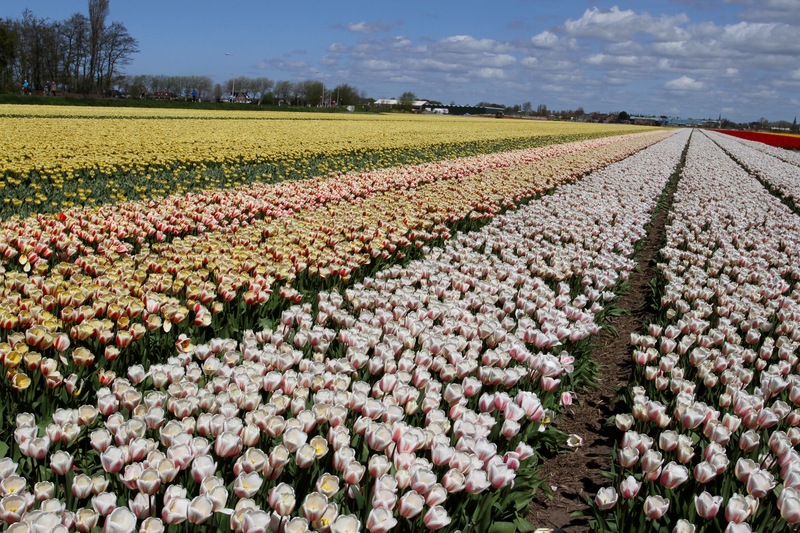 Surprisingly, many flowers are not sold, but simply discarded in favour of harvesting the bulbs. 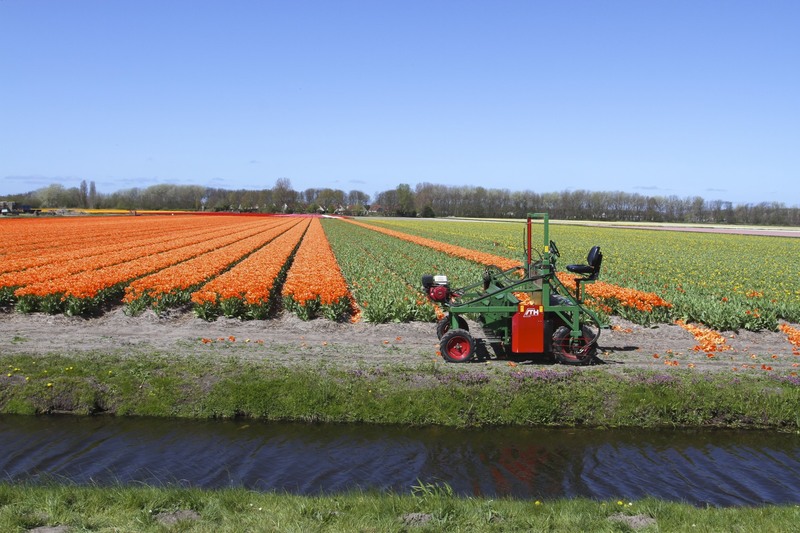 These days, flowers and bulbs account for a significant portion of Dutch agricultural exports. 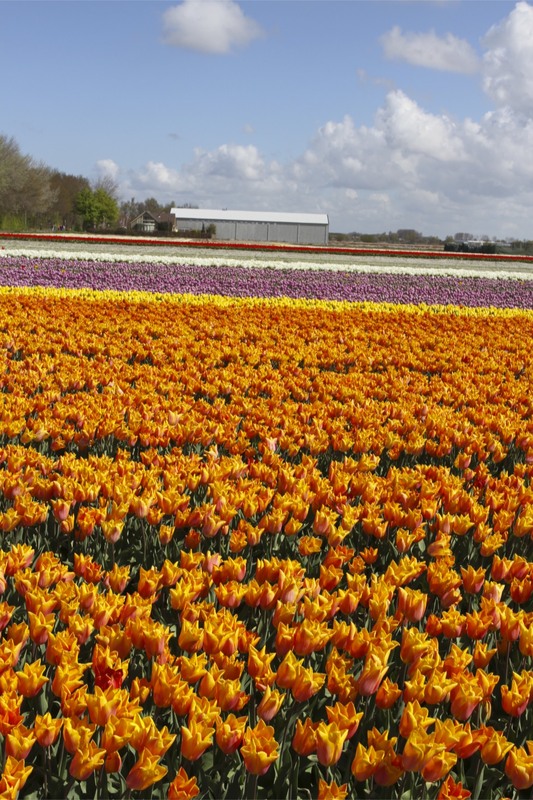 To put that into context, Dutch flower, bulb and other plant exports make up around two-thirds of total global exports. Not bad for a country with a tiny amount of agricultural land, most of which is below sea level. 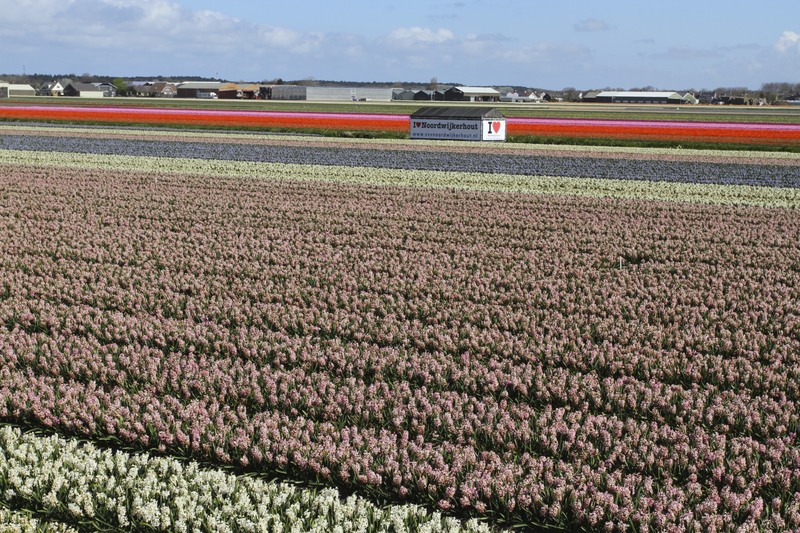 It’s a trade that has transformed the Dutch landscape, and although you get flowers year-round, April is ‘Peak Flower’. It makes for quite an unusual tourist experience. Thousands of people flood into countryside which, for the rest of the year, is completely devoid of tourism. 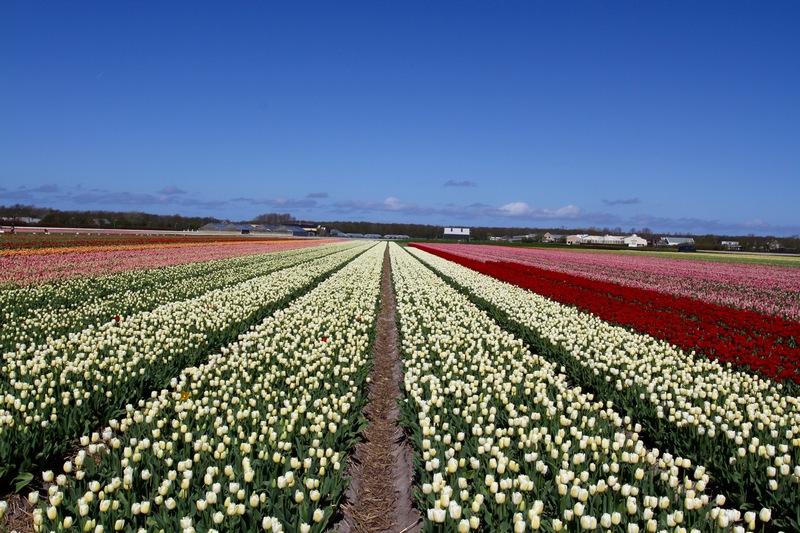 It’s an entirely new form of ‘tulip mania’, although these days tulips don’t cost the same as a house in Amsterdam. 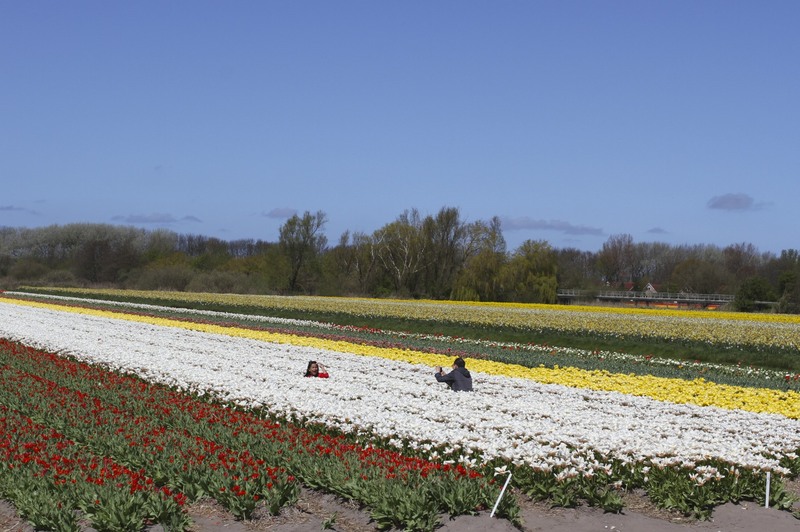 As you cycle around you can spot people crouching amongst the flower fields having photos taken, while nearby farmers are spraying, harvesting or checking their flowers. 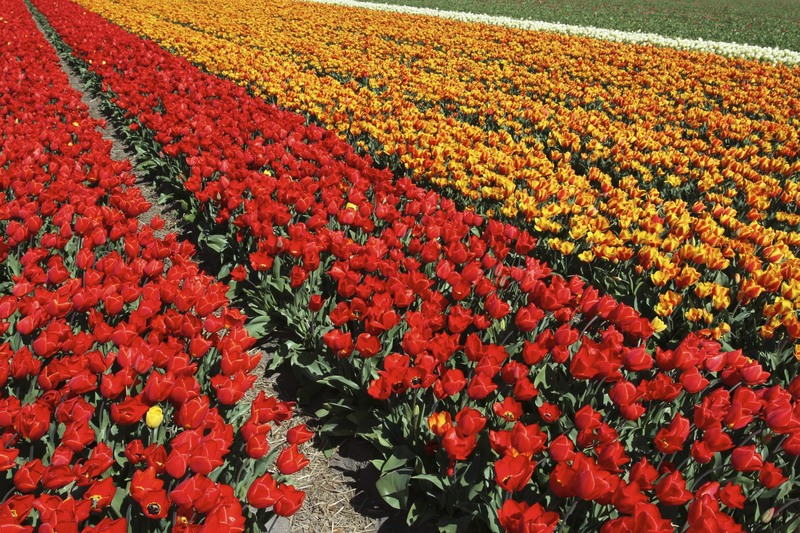 Many tourists visit the (admittedly extraordinary) Keukenhof gardens, which are home to over 7 million flowers. 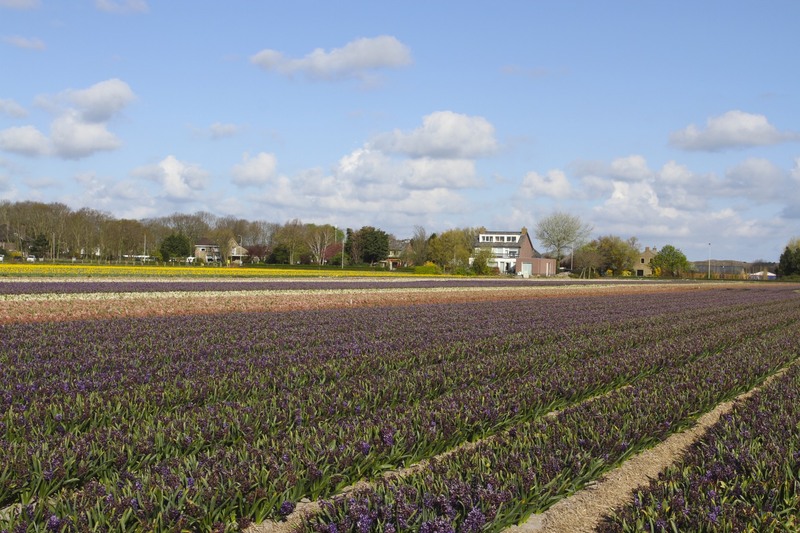 Keukenhof tends to get extremely busy, and a more relaxed, interesting and free way of getting to see the flowers and the communities that grow them, is to hop on a bike and meander between this region’s villages. 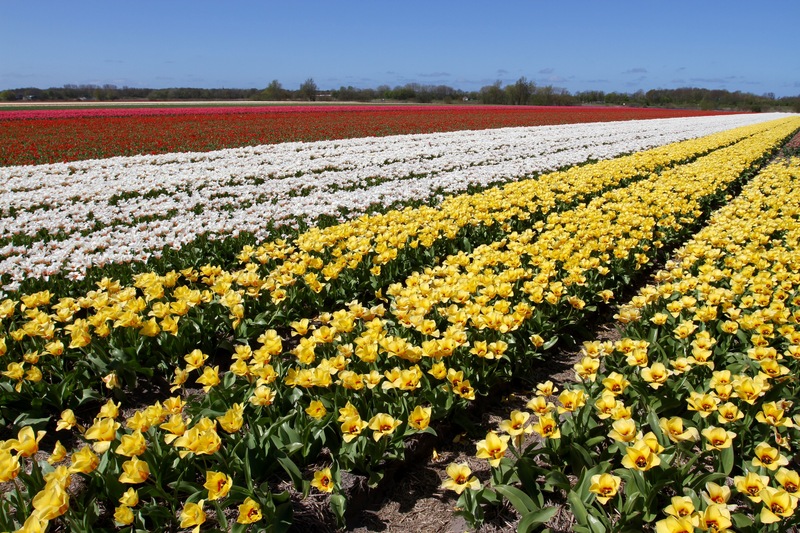 If you’re lucky, you may come across flower-related festivals taking place, or flower mosaics that are entered into local competitions. 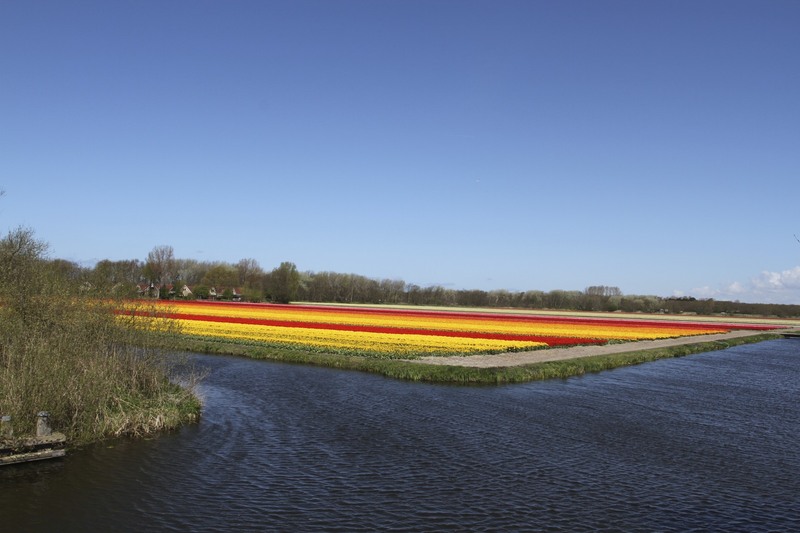 On a good day, and the weather at this time of year can be very hit-and-miss, the fields are almost luminous, lending an other-worldly feel to the Dutch landscape. It’s an experience to which photographs don’t really do justice so, if you have the chance, it’s well worth making the effort to see the flowers up close and personal. I discovered the history of the tulip watching a play at the National Theatre in London. The adaptation of Jeanette Winterson’s novel, The PowerBook, sticks in my mind because of the mesmerising performance from Fiona Shaw. 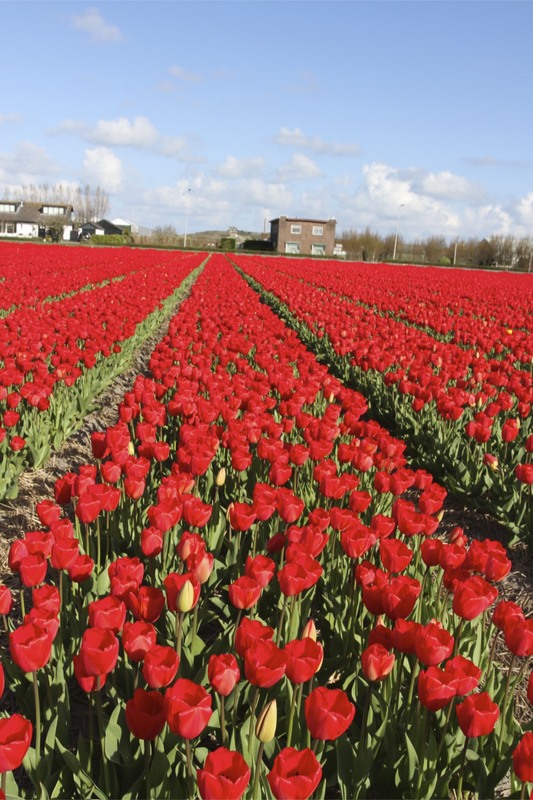 A meditation on love and the transformative nature of fiction, it also features an androgynous Turkish woman who ‘traded’, for which read ‘smuggled’, much coveted tulip bulbs out of Turkey to the Netherlands. She did so by putting them into her trousers and disguising them as testicles. Several things have stayed with me from that evening: good theatre can really be very good; the origin of the tulip was Turkey not the Netherlands; and that tulip bulbs can double as testicles when being smuggled across land borders. While many in the audience were focused on the intrigues of the lovers who were central to the play, I was making a mental note to research why someone would smuggle a tulip bulb in their pants. 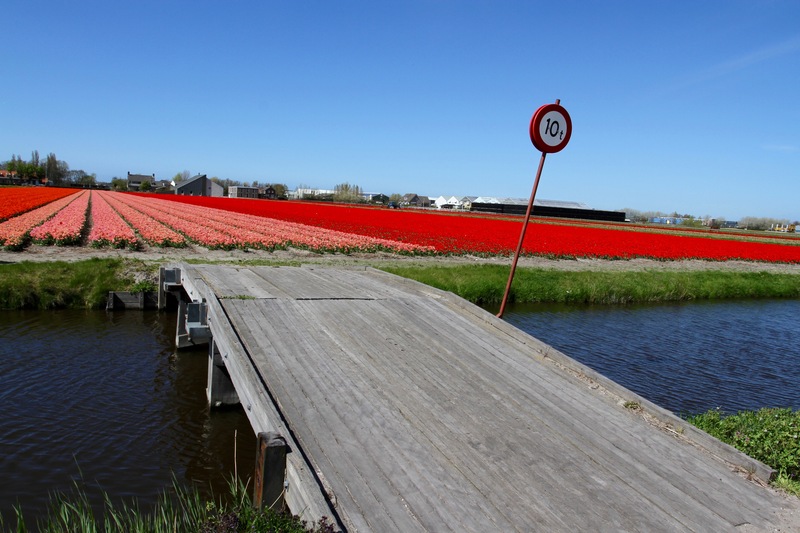 That’s how I found out about ‘tulipmania’. To start at the beginning. 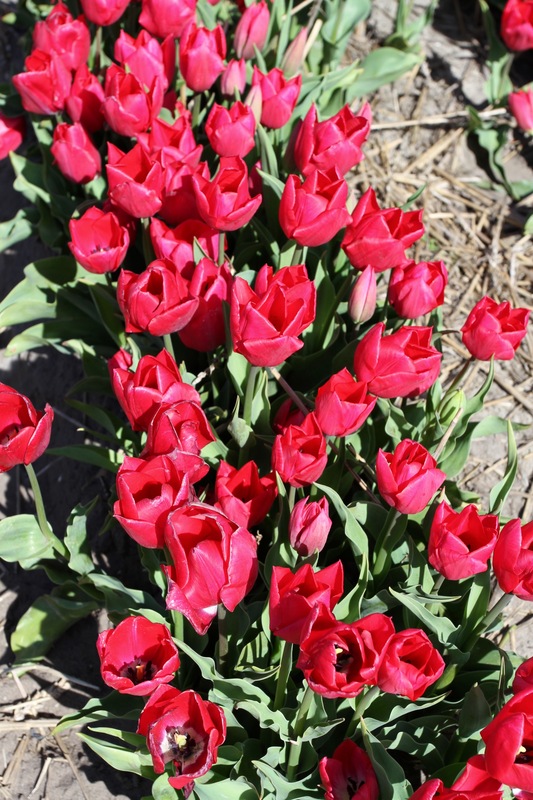 Tulips were originally a wild flower that grew across Central Asia. They were cultivated in Turkey perhaps as early as 1000 AD, and became very, very popular during the Ottoman Empire. 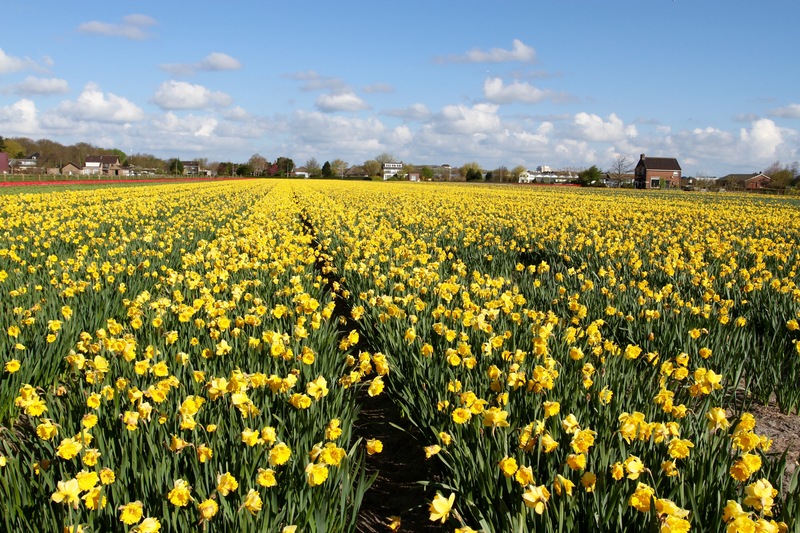 The bulbs made it to the Netherlands via a circuitous route in the 17th Century. At that time Leiden was one of Europe’s premiere centres of learning, their botanical gardens the subject of envy. This attracted Austrian biologist, Carolus Clusius, to take up the position of director of the Hortus Botanicus at Leiden University in the 1590’s. Clusius’ old friend and fellow plant fancier, Ogier Ghiselain de Busbecq, was at the time Austrian ambassador to the Ottoman Empire in Constantinople (modern-day Istanbul). It was de Busbecq who obtained the bulbs and sent them to Clusius. History remains silent on whether these particular bulbs were smuggled while disguised as testicles. 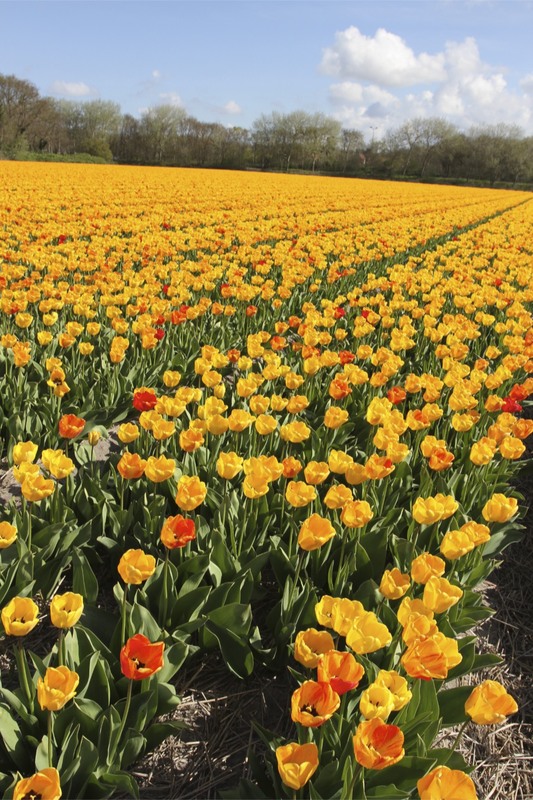 So it was that the very first tulip bulbs arrived in the Netherlands; they were planted in Leiden University’s botanical gardens from where their fame spread with tragicomic effect before leading to utter disaster. 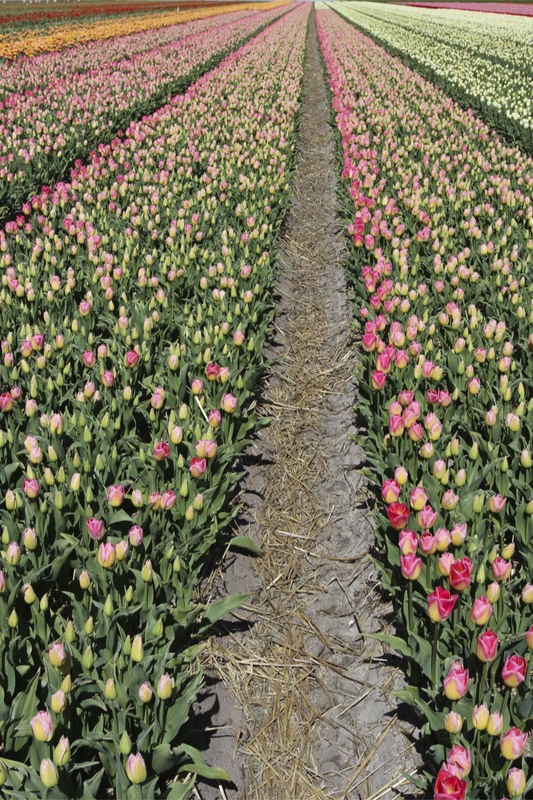 Fast forward a decade or two, and everywhere you look in the Netherlands you find tulipmania. ‘Mania’ is rarely a good word, it implies an uncharacteristic type of obsessive behaviour defying all reason. Not wishing to offend my Dutch friends, exempting King’s Day and New Year’s Eve when all Hell breaks loose here, that is not the type of behaviour for which they are known. Resolute, conservative, notoriously cautious with money, Calvinist work ethic behaviour bordering on the dour? Yes. Becoming manic about a flower? No. It just doesn’t fit the national stereotype. 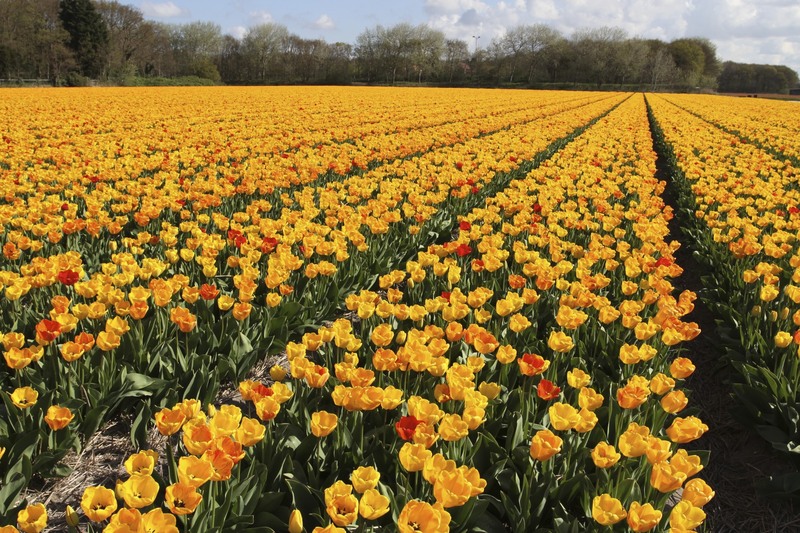 Yet what happened in the Netherlands in the 1630s can only be described as collective mania, and at the heart of it was the humble tulip bulb. Imagine, a man visits your house, he’s hungry and spots what he believes is an onion. He slices it and eats it before realising the enormity of his error. The ‘onion’ turns out to be a tulip bulb of enormous value. The man is arrested and thrown in jail. 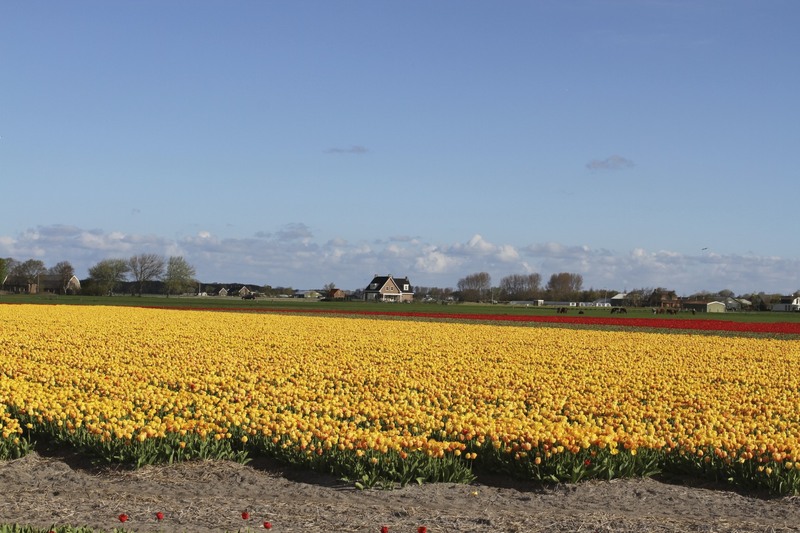 This is a true story, and one that illustrates what happened during tulpenwoede (tulip madness). 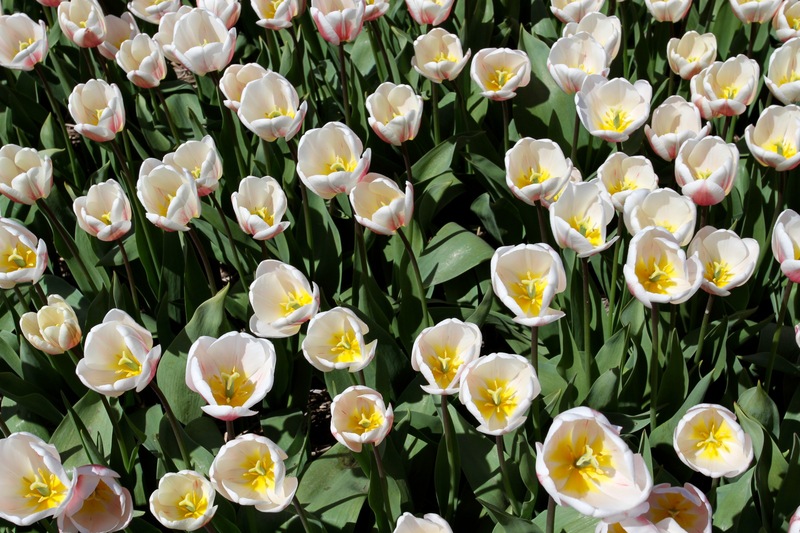 Tulips became so sought after, so desirable, that people were willing to pay vast amounts of money even for normal bulbs. Rare bulbs were worth a small fortune, literally. 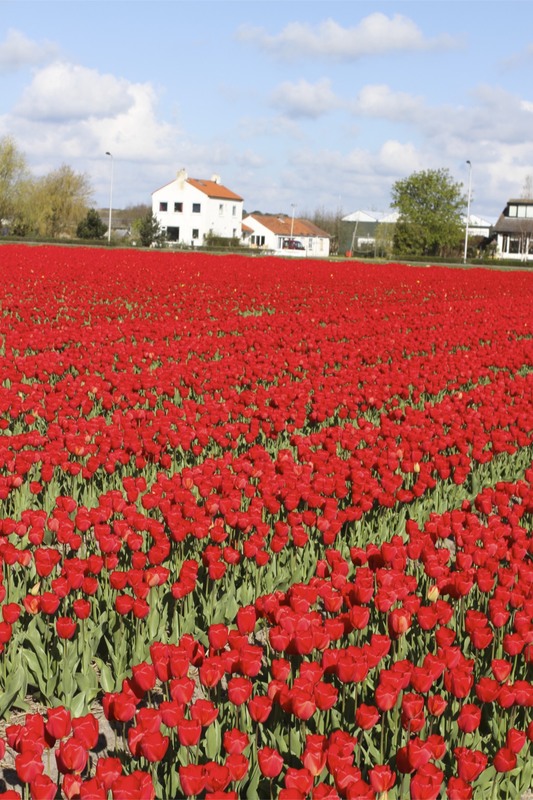 A rare bulb of exquisite colour called Semper Augustus could exchange hands for up to 5000 guilders, the same price as a sizeable house in Amsterdam. 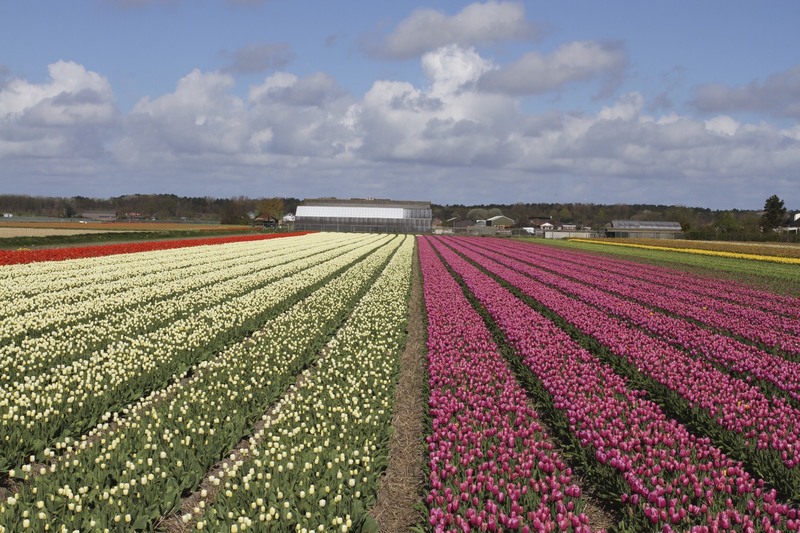 People went crazy for tulips and the money changing hands was equally crazy. People sold their houses, farms, possessions and even their clothes to purchase bulbs. 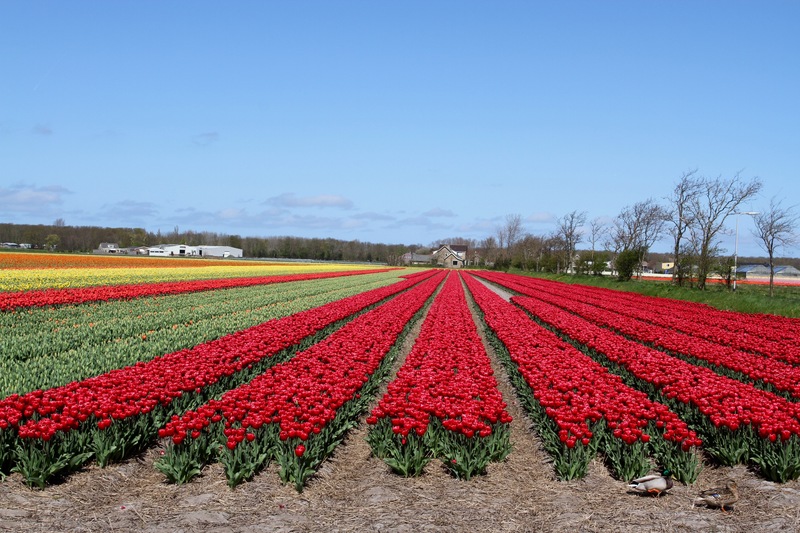 Tulip traders, just like today’s stock traders, could be found throughout the Netherlands trading bulbs and even tulip ‘futures’. 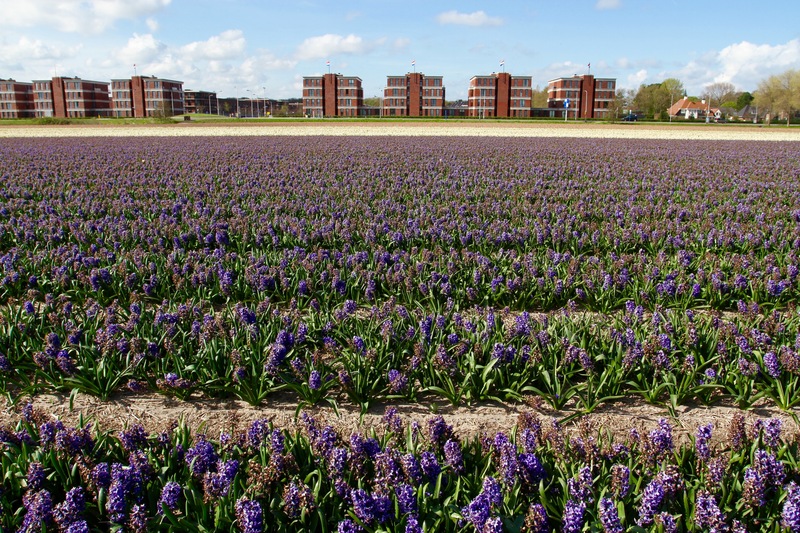 The trade peaked in the winter of 1636, when a Violetten Admirael van Enkhuizen bulb was sold for an all time high of 5200 guilders. 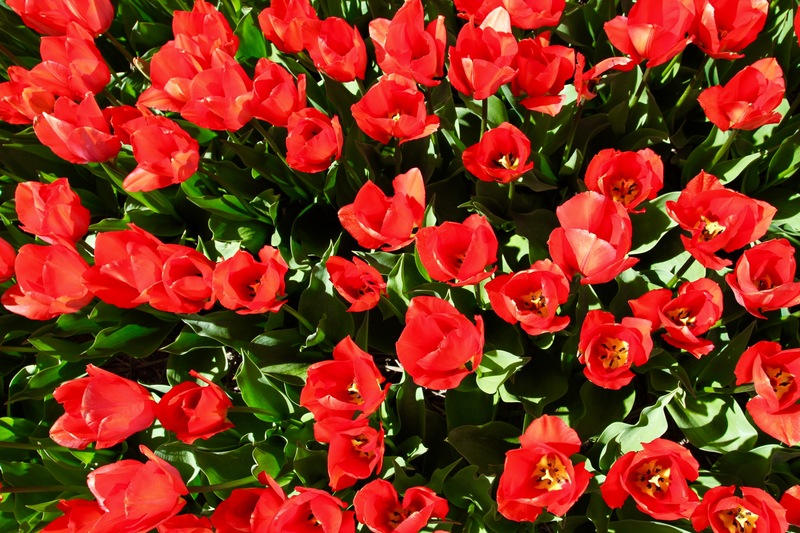 Then, in February 1637, panic swept the tulip trade and the madness came to a brutally abrupt end. As quickly as tulipmania had started the whole market crashed – think 1929, Wall Street traders throwing themselves out of windows, type of crash. As recent history shows, unregulated financial speculation fuelled by vast greed for fast profits rarely ends well. 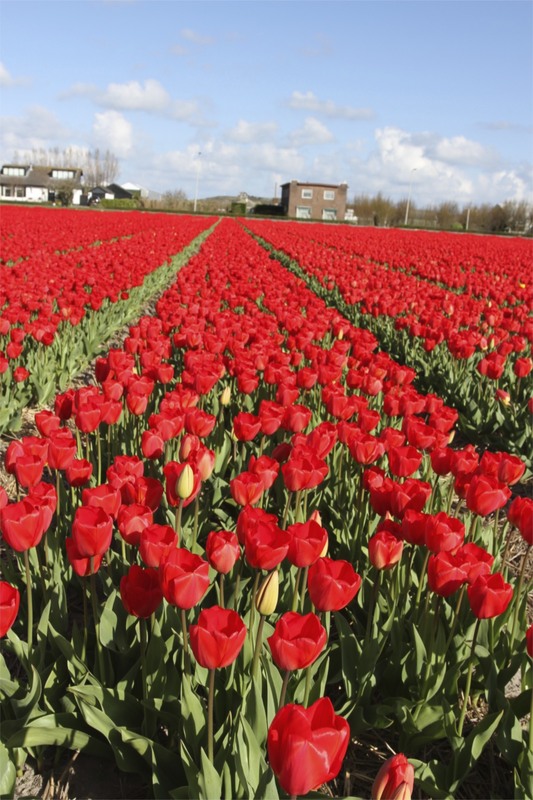 Thousands of people lost out and the tulip went back to being just a flower. 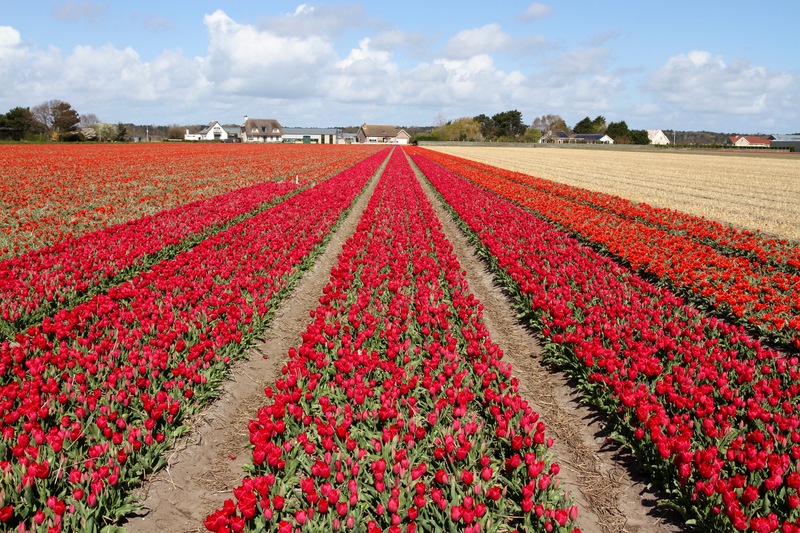 Given this history, it is remarkable that the Dutch didn’t just throw all the remaining bulbs into the ocean. Instead they are still grown and still making money on the international markets. 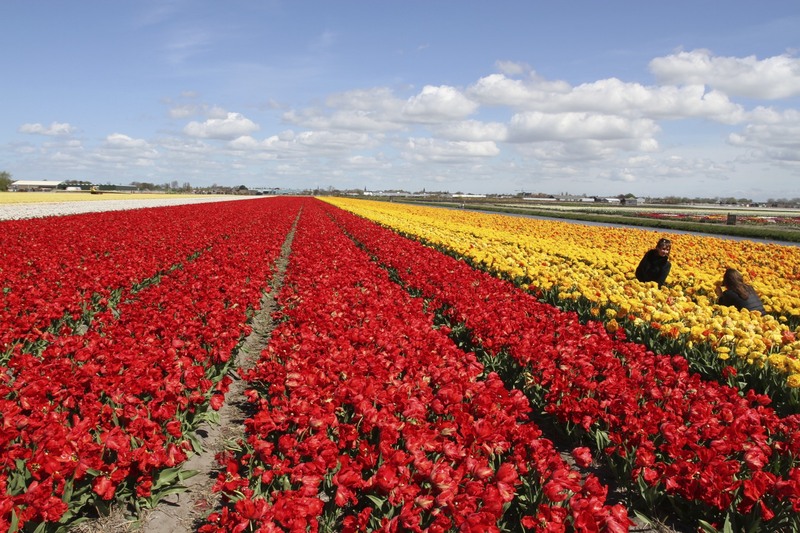 Millions of flowers and bulbs are sold for export each year, making the Netherlands the world’s largest exporter. 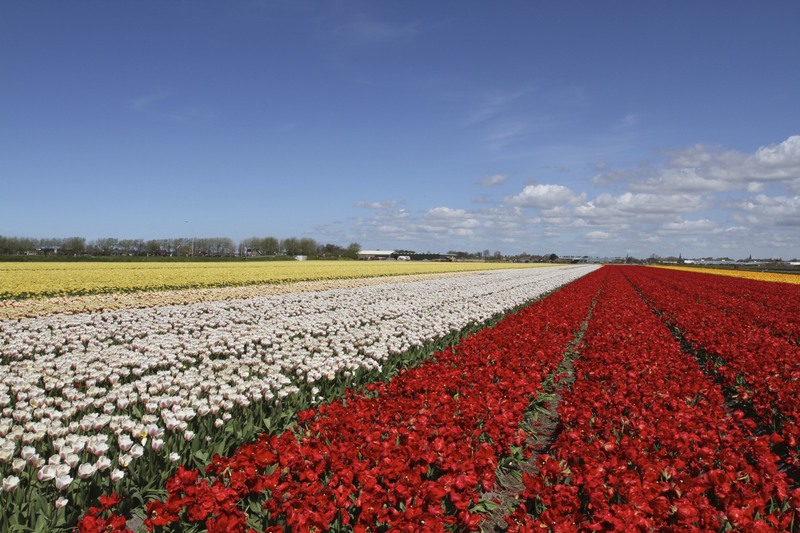 In fact, the Dutch control about 50 percent of the global flower and bulb trade. 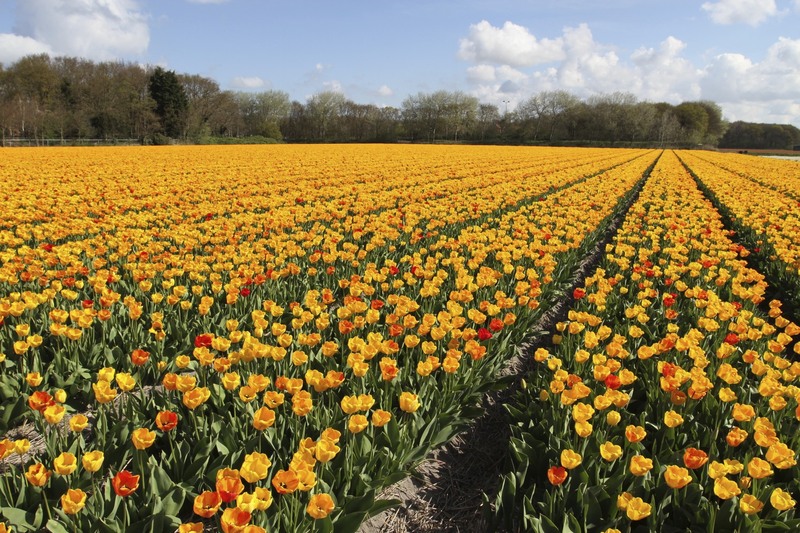 A flower can be cut in the Netherlands in the morning and be on sale in New York the same day. 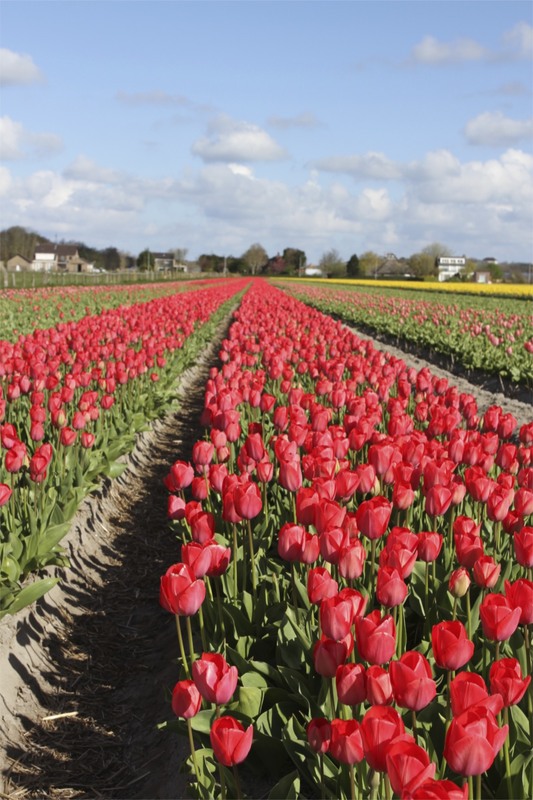 Each year the Dutch grow around 4.3 billion tulip bulbs; 2.3 billion are grown into flowers. 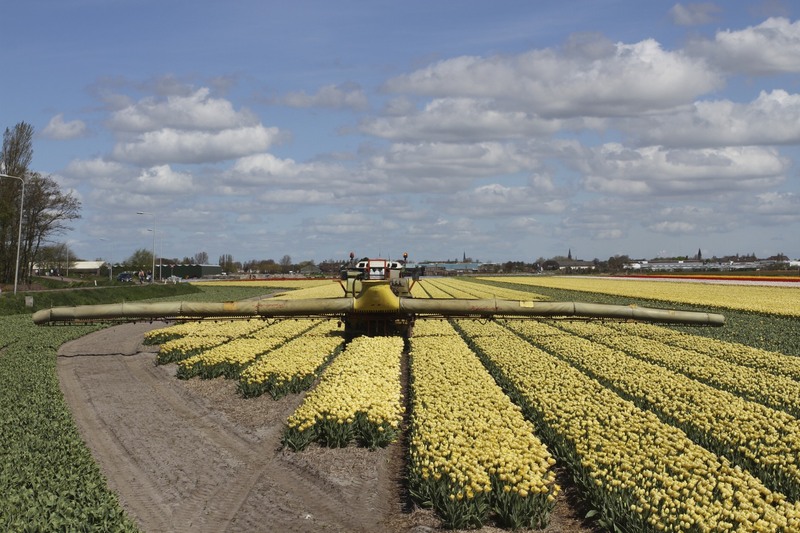 Of these, 1.3 billion are sold in the Netherlands, the other 1 billion are sold in Europe and around the world. 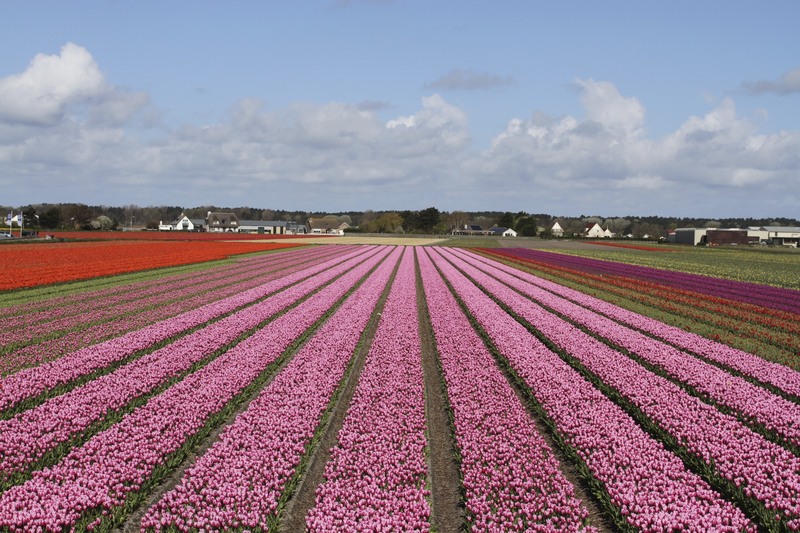 The value of all these flowers and bulbs runs into billions of euros. It’s as if tulipmania never ended. Spring is always welcome in Northern Europe. A reminder that winter is over and summer just around the corner, the world seems to come back to life: birds arrive from distant lands, daylight extends into the evening and colour comes flooding back into the landscape. It’s no wonder that throughout history civilisations around the world have celebrated the arrival of spring as a joyous event, the cycle of renewal and rebirth starting anew. 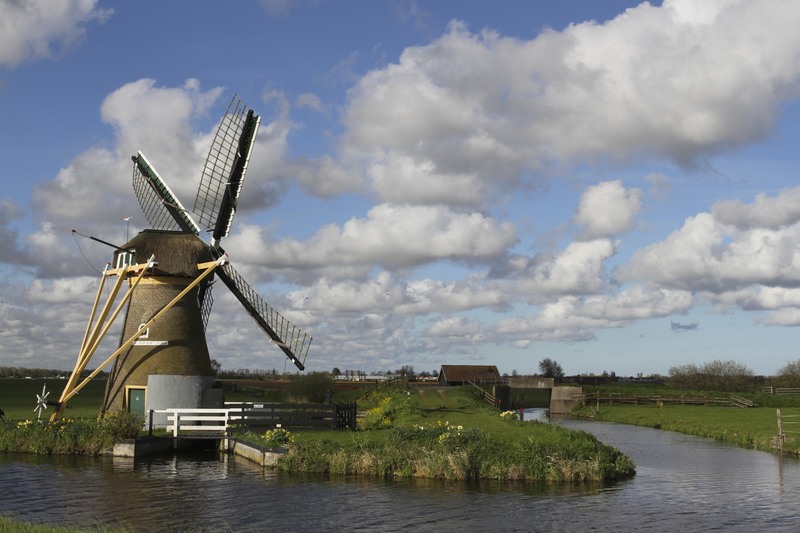 This takes on a different meaning in the Netherlands, a country where tulips vie with clogs and windmills for most popular cliché. 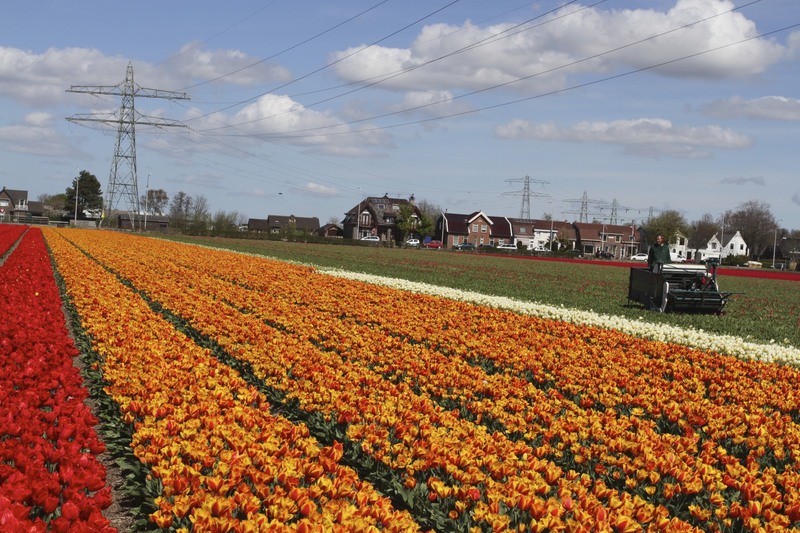 Not many people wear clogs these days; there are plenty of windmills, most surviving as quaint reminders of a bygone era; but flowers are still a massive industry in the Netherlands, particularly tulips, which are as popular as they’ve ever been since they arrived in the country in 16th Century. 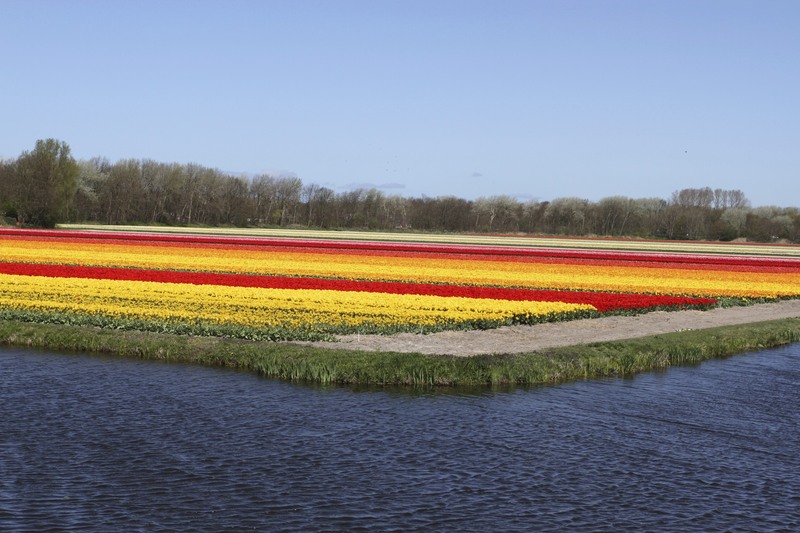 For a brief period in spring, brilliantly coloured flowers illuminate the Dutch landscape. It’s magical, and luckily for me the main centres of flower growing are just up the road. 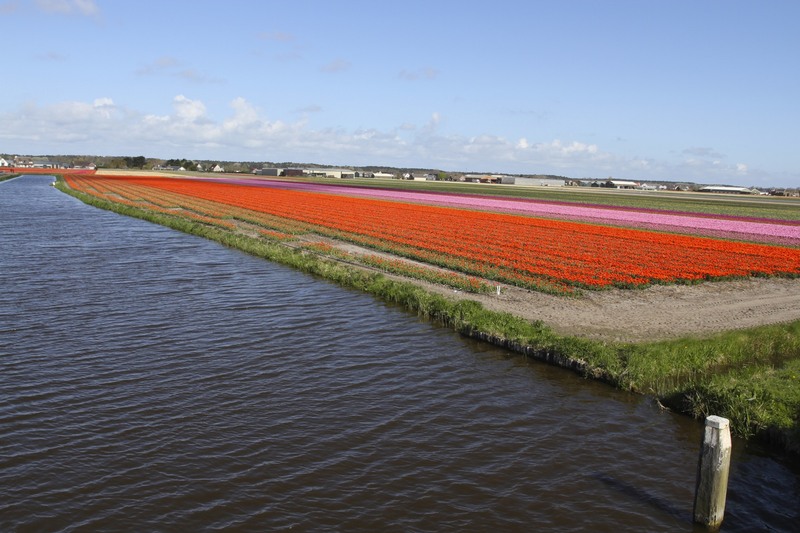 The Dutch have taken flower growing to extremes, vast swathes of land are given over to cultivating blooms of one sort or another. 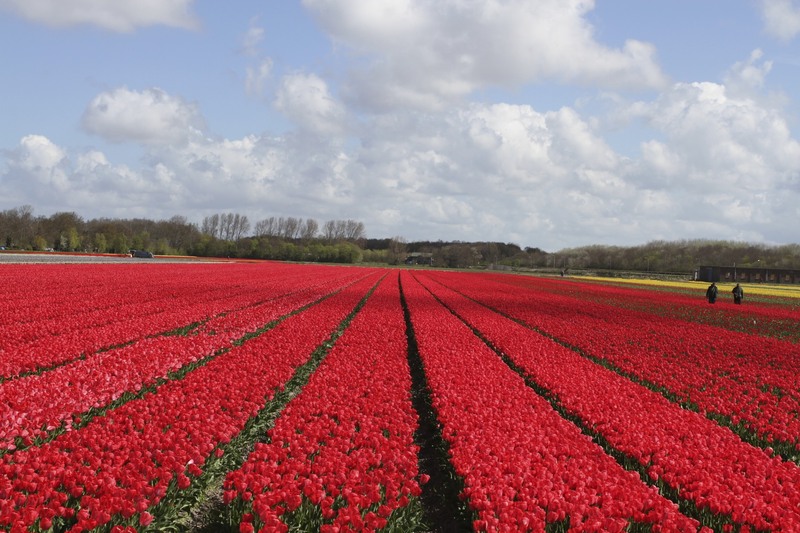 I missed the flower action last year, but was determined that I’d see the bulb fields in bloom this year. 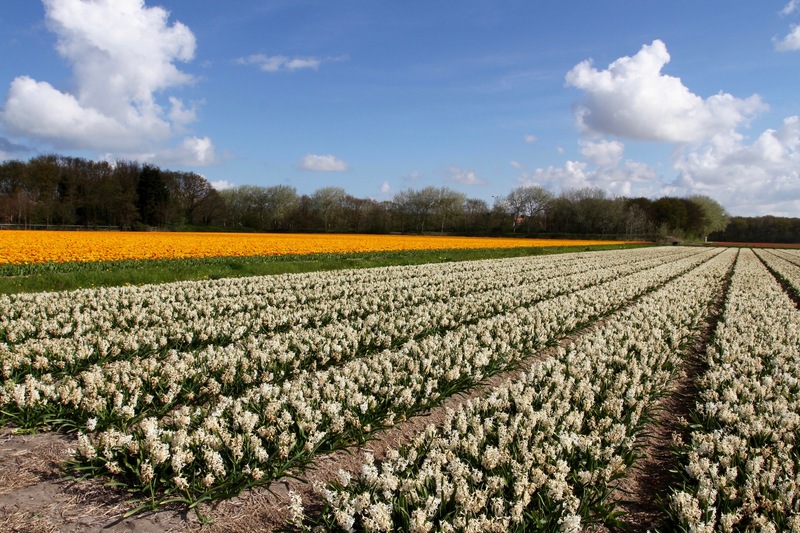 The main season lasts for around eight weeks, but timings are still determined by nature; knowing where and when is a bit of a lottery, but there are websites dedicated to tracking where flowers are flowering. 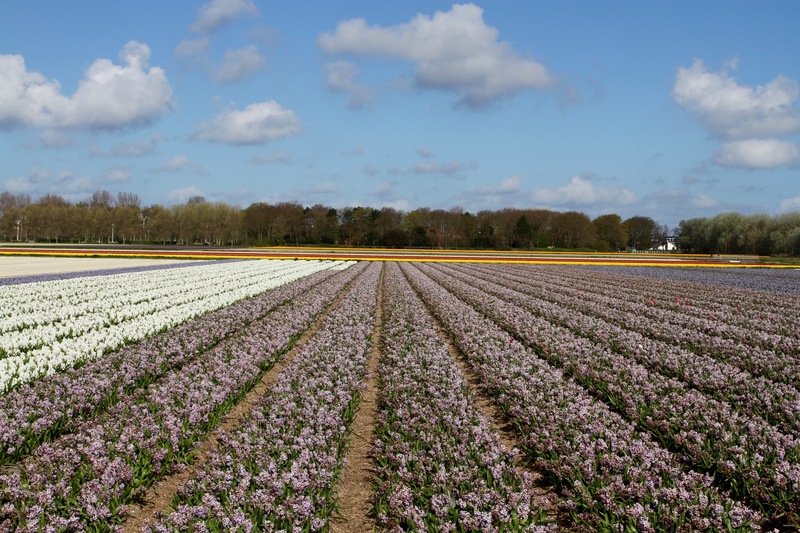 While this is regarded as tulip season, there are also huge numbers of daffodils and very strong smelling cut lilac. All you have to do is hope for good weather and get on your bike. 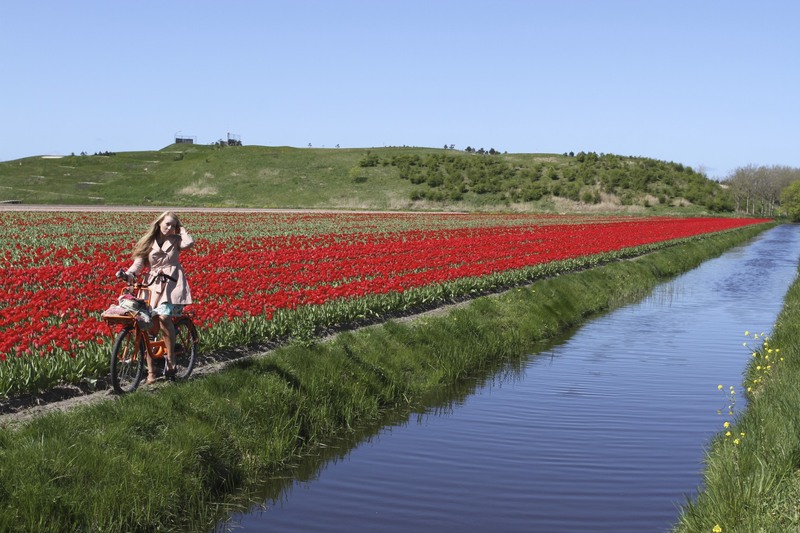 There are bulb fields everywhere in the region between Leiden and Haarlem, free to view for those who are prepared to cycle around the country lanes. 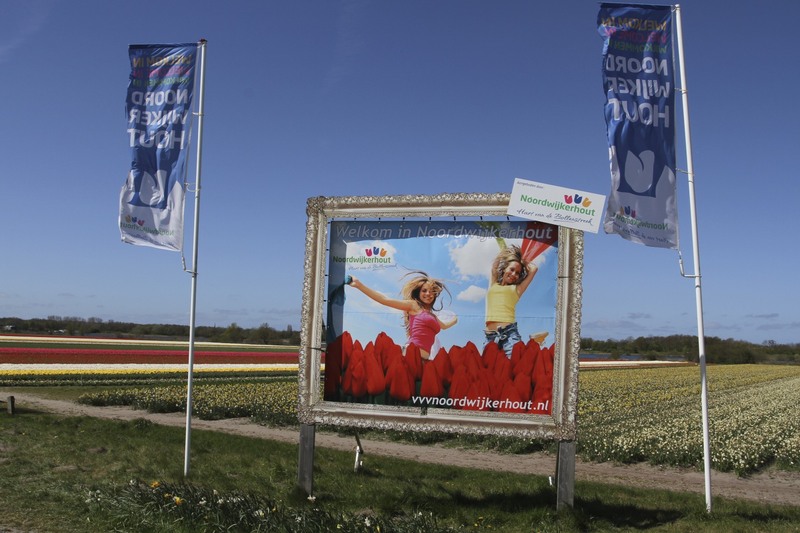 Yet each year vast numbers of people visit the Keukenhof Gardens instead. 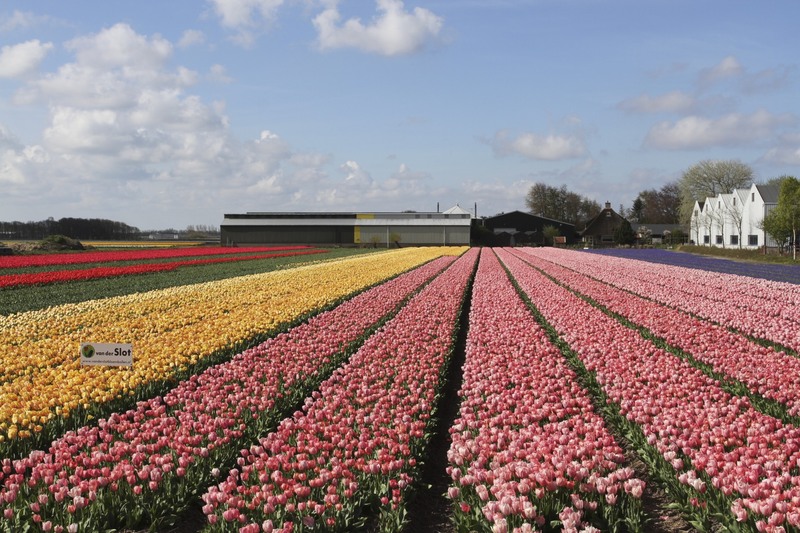 One of the Netherlands’ most popular tourist attractions, the Keukenhof is a vast estate that in spring comes alive with a riot of around 7 million flowers – no, that’s not a typo, 7 million. It also comes alive with visitors. During the eight week flower season over 800,000 people visit the gardens – 100,000 per week, 15,000 per day. 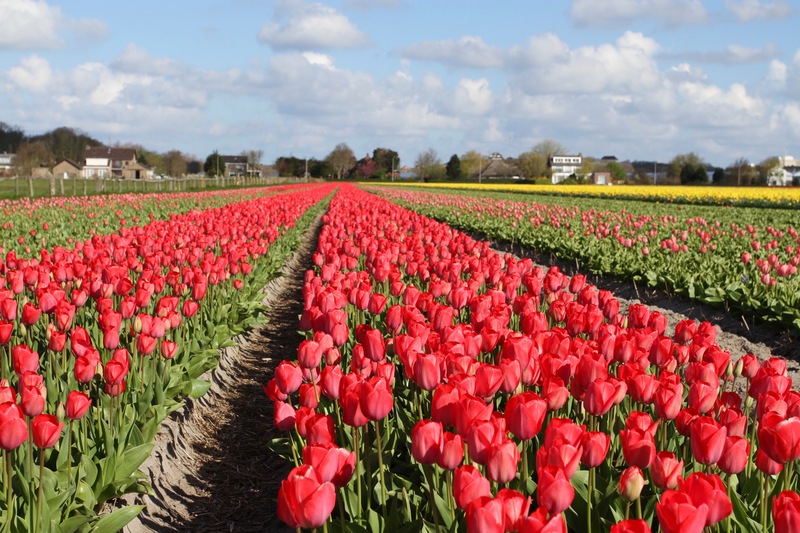 I’m sure Keukenhof is beautiful, but the idea of rubbing shoulders with thousands of other people while trying to enjoy nature isn’t my idea of fun. 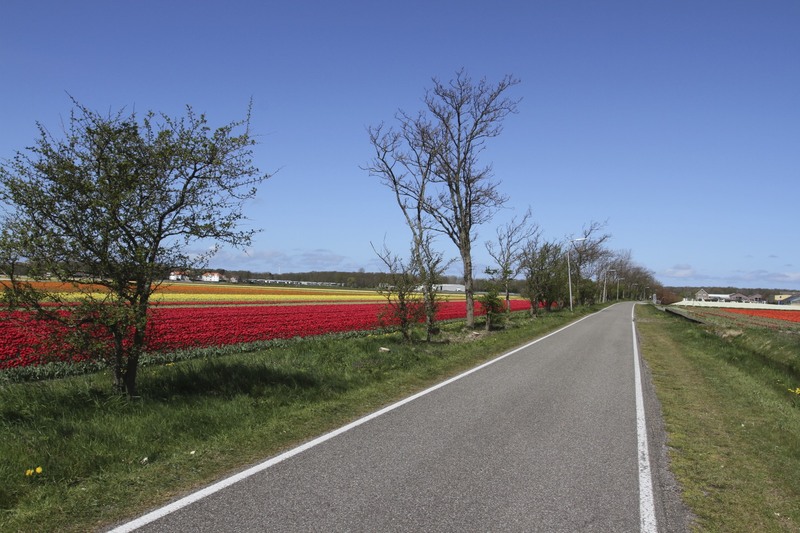 Besides, cycling around the lanes gives you a much better understanding of the countryside and a real sense of Dutch flower growing. In some fields I saw flowers being harvested. 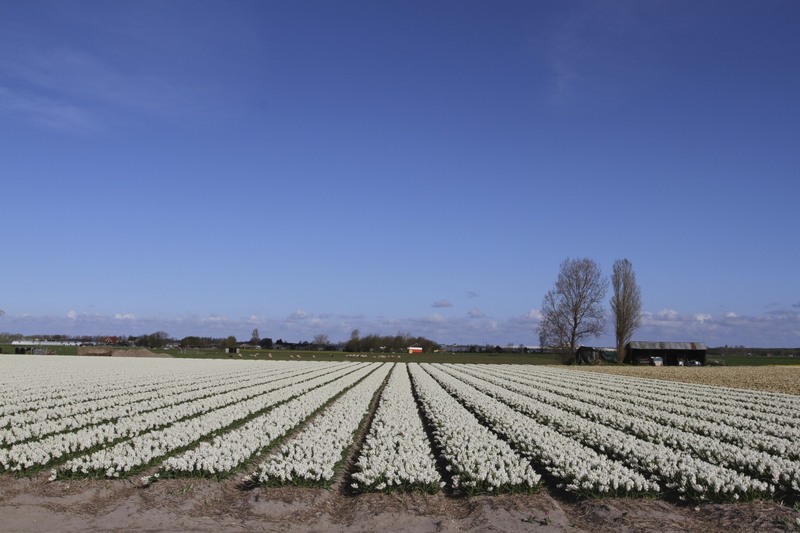 Unless you want to follow one of the several cycle routes, once you’re in the right area you can largely just go in any direction and there will be bulb fields. I was constantly heading off down small lanes because I’d spotted more flowers. It’s not like you can miss them, huge numbers of flowers, spread over acres of land, so bright you can probably see them from space. En masse the sight of the flowers is truly astonishing. I’d set off with an ‘it’s one of those things you have to see’ attitude, but after actually seeing them I found myself becoming a little mesmerised. This probably accounts for the eight hours I spent cycling around, and the severe sunburn I received as a consequence. 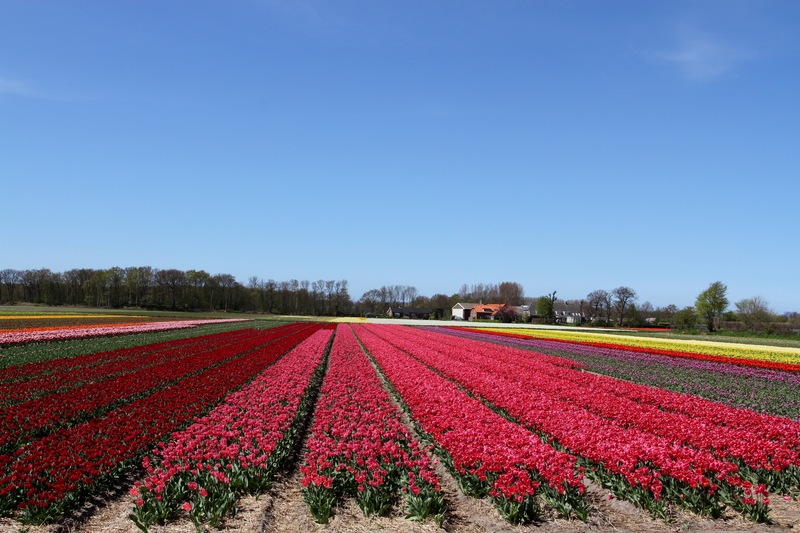 It will be another twelve months before the tulip fields of the Netherlands bloom again, but if you were wondering if they’re worth seeing, the answer has to be ”yes”. The huge blocks of colour are an amazing sight. I’ll be back to see them again next year, that’s for sure.